Archie Comics is not afraid to spice things up with non-continuity books featuring the Riverdale gang in alternate realities. Whether it's a zombie horror book (Afterlife with Archie), a fledgling rock band (The Archies), or crossing over with other characters (KISS, Ramones, Predator, Punisher), Archie and the gang have been through a lot of fun adventures. None have been more fun or as liberating as this new series, Betty and Veronica: Vixens. can almost hear "Born to be Wild" playing in your head, Jamie Rotante sets the tone as they circle a trailer of Southside Serpents. These badass bikers mean business and aren't to be trifled with. The shocking part is that the leaders are none other than Betty Cooper and Veronica Lodge and they've left the patriarchy behind along with their poser boyfriends. Sisters are doing it for themselves. The issue flashbacks to three weeks earlier and Archie and Reggie think they're really cool trying to start a gang. They invite the girls to cruise over to a Serpent bar on their motorcycles. Rotante really succeeds in revealing the essence of the characters we know and love despite looking cooler than we remember through the pencils of Eva Cabrera. Betty is the straight-A student unsure about going out instead of studying, Veronica is the rebellious rich girl seeking a good time, Archie is the square peg trying to fit it even if it means hanging out with a jerk like Reggie. They're all decked in really cute outfits inspired by the 1950's. The dialogue is a little racier than the main Archie title with a little more attitude especially from the Serpents, more realistic with even words censored. It's a delightful take on The Wild One and Rebel Without A Cause as only Archie Comics can do. The real takeaway is the Thelma and Louise influence where they take matters into their own hands after Archie accidentally draws the ire of the Serpents. The boys turn out to be useless and the girls' shared passion for the freedom of the road atop an iron horse instills a new confidence and a rebellious bond that galvanizes their newfound sisterhood. With the Serpents poised to retaliate, Betty and Veronica have plans of their own. Cabrera's art is playful and expressive with a great eye for fashion and design. Lines look less rigid allowing for more rounded shapes lending itself to the independent spirit of the book. It's the right tone and look for this alternate world that is about to take off. Elaina Unger mixes earth tones and pastels for clothing with blues and reds for the surroundings. The colors accentuate everything with a subtle touch giving way to the stark contrast of the leather jackets. 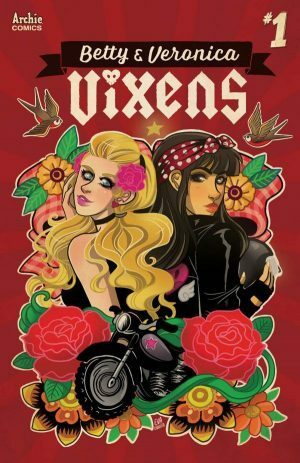 'Betty and Veronica: Vixens' is pure fun with an empowering feminist twist that leaves behind the classic love triangle and trades it in for black leather, motorcycles, and brass knuckles. You've never seen Betty and Veronica quite like this and it shows what Archie Comics' alternate stories can do. Get your motor running to your local comic shop and pick this up.